Infected with the Joker Virus, Batman struggles to maintain his sanity as the Batman Who Laughs continues his killing spree among the streets of Gotham. As the Joker’s life hangs by a string, Batman races against the clock to stave off the virus and attempt to stop his twisted multiversal counterpart from executing his plans. 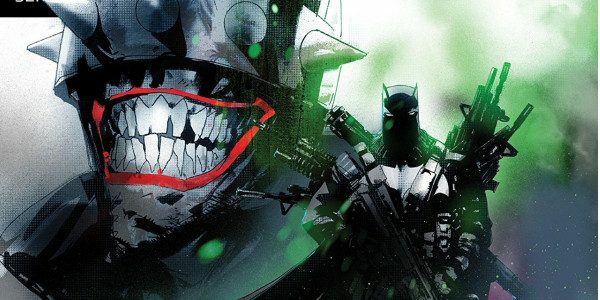 Can Batman save the Joker and his Sanity in time to stop the Batman Who Laughs? What is the Batman Who Laughs hiding from Batman? What is his connection to the Grim Knight? Why is the Grim Knight helping someone like The Batman Who Laughs? 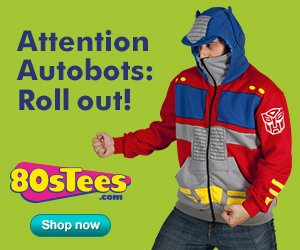 Can Batman survive long enough before his shadow takes over?!! Man, this issue is just full of surprises! After a successful first issue, Snyder is proving that he hasn’t lost his touch with his horror roots, and most of all his roots in regards to Batman. Throughout most of my time reading this issue, I couldn’t help but feel that the book was exuding Batman Black Mirror vibes, where it’s more focused on the mystery /horror factor than the typical action that is usually associated with most of the Bat-titles these days. 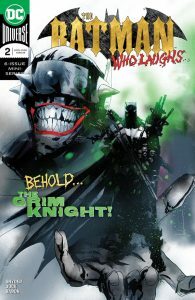 Snyder goes for a more cerebral introspective approach with this issue as Batman struggles to stave off the Joker virus as he continues his investigation about the Batman Who Laughs plans for Gotham and reality itself. More deceased versions of Batman show up, bodies piling up, increasing The twisted Batman Who Laughs reputation as a formidable for that is more than just an action figure accessory pitch. But that’s what Snyder always made sure to avoid as his writing shows that he cares about the structure, and characterization, and motivation of the characters involved in this series. There are some twists and turns that will leave readers surprised. And if you’re familiar with how Snyder got his start on Batman, then there is a surprise that is worth checking out that cannot and should not be spoiled at all! Snyder gets more room to explore a bit more about The Batman Who Laughs plans, and we get to see a bit of action from the Grim Knight. But unfortunately we don’t get too much of the Grim Knight, but with the brief appearances, he’s already left a strong impression as a cunning tactician that does not waste any move on the field. But what makes The Batman Who Laughs interesting is how ensures that whenever he carries out a plan, It is always executed with precise precision, always going for the jugular. The structure and pace of the story is smooth and full of dialogue, exposition and character moments that makes the reader glue their attention to the pages with excitement. I had moments where I was taking my time, soaking in any and every piece of information, making the reading worthwhile and fun. In terms of art, Jocks art is in top form showcasing a variety of essences that are contained with each character that appear in the pages. His Batman Who Laughs is terrifying, but his best work in the pages where Batman is struggling to maintain the Joker Virus that is slowly taking over his body. Jock has a knack for using silhouettes and contour lines to convey the right kind of atmosphere and emotion that is expressed through the narrative and its characters. David Baron’s colors match up wonderfully with Jock’s heavily inked figures, giving the book a beautiful contrast that allows for color to shine throughout the dark caverns that Jock’s art creates within the pages of this title. This is a very worthwhile issue that is just as good as the first issue and continues to build the tension. I feel that Snyder is really at his best on this book, and it stands that Snyder has not lost his touch when it comes to writing Batman stories, especially mystery and horror. This is a very worthwhile issue that by the time you get to the end of this installment, it’ll get you hollering for the next issue. 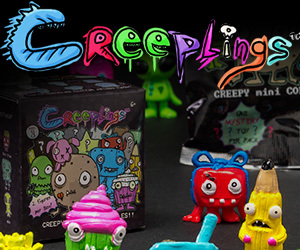 Pick it up and add it to your pull list for new comic book day!